TAGG Metal is premium quality earphone under reasonable price boasts of a powerful 10 mm drivers for High definition sound and super extra bass. It's super-built quality and design is adding the glamor. It is one of the few headphones that offers a great deal of sound quality, classy design and value for money. Let's go further and find out what's special about this piece of gadget. You can feel a booming sound with incredible bass and treble. 0.3 % harmonic distortion, speaker resistance of 16 Ohm & sensitivity range of 98 db +/- 3db minimizes any distortion of sound quality, you will definitely have an amazing auditory experience. Specially designed driver with high-energy neodymium magnets delivers deep, powerful bass taking music experience to another level. A tightly sealed acoustic design allows for a high level of sound isolation which aides in the reproduction of powerful bass response and lets you enjoy your favorite songs with greater clarity. TAGG Metal comes up with 3 sets of ear tip sizes ensures a proper fit for everyone. Durable comfortable design earbuds ensures that earphones always stays in place during the exercise, less likely to fall out. Invisible nano-coating technology protects earbuds against sweat during intense exercise. Multi-Functional control to easily Answer or end calls, volume change, and skip tracks without digging for your device. It also featuring noise-canceling microphone helps with trouble-free receiving of calls allows you to receive calls on the go and also Enables user to enjoy listening to the music in a chaotic and noisy environment. The perfect length cable will let you move your head around while using these earphones on different occasions. With the stylish design and high-end sound quality, Metal earbuds are compatible with the latest generations of iPod, iPhone, and iPad and it works with all Androids devices with a standard 3.5 mm jack. 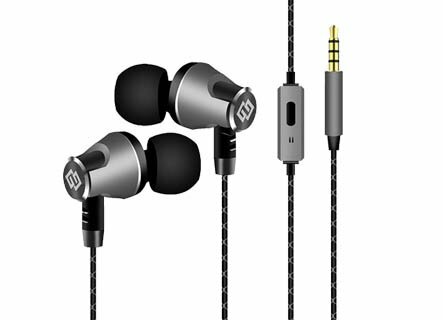 Easily take calls and manage your music on any smart device makes these earphones extremely user-friendly. If you find this high quality "value for money" earphone interesting check it's current availability.